Cryptochromes are blue-light absorbing photoreceptors found in many organisms where they have been involved in numerous growth, developmental, and circadian responses. In Arabidopsis thaliana, two cryptochromes, CRY1 and CRY2, mediate several blue-light-dependent responses including hypocotyl growth inhibition. 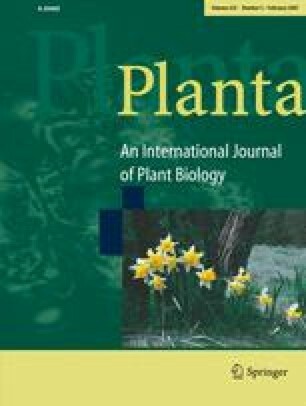 Our study shows that an increase in the intensity of the ambient magnetic field from 33–44 to 500 μT enhanced growth inhibition in A. thaliana under blue light, when cryptochromes are the mediating photoreceptor, but not under red light when the mediating receptors are phytochromes, or in total darkness. Hypocotyl growth of Arabidopsis mutants lacking cryptochromes was unaffected by the increase in magnetic intensity. Additional cryptochrome-dependent responses, such as blue-light-dependent anthocyanin accumulation and blue-light-dependent degradation of CRY2 protein, were also enhanced at the higher magnetic intensity. These findings show that higher plants are sensitive to the magnetic field in responses that are linked to cryptochrome-dependent signaling pathways. Because cryptochromes form radical pairs after photoexcitation, our results can best be explained by the radical-pair model. Recent evidence indicates that the magnetic compass of birds involves a radical pair mechanism, and cryptochrome is a likely candidate for the avian magnetoreception molecule. Our findings thus suggest intriguing parallels in magnetoreception of animals and plants that appear to be based on common physical properties of photoexcited cryptochromes. This work was supported by the National Science Foundation (grant 0343737 to M.A. ), the Human Frontier Science Foundation (grant to R.W. and T.R.) and the Deutsche Forschungsgemeinschaft (grant to W.W.). T.R. thanks the Sloan foundation for support. We thank K. Stapput and B. Siegmund for their help.